Vade Retro Satanas : Sun, Jupiter, Quasar and Coincidences. The orbital period of Jupiter is 11.8 years. The object X which is looked for is Jupiter. The solar cycles and those of OJ 287 are aligned on the orbital period of Jupiter. The Tides provoked by Jupiter in the Sun could be the cause of this phenomenon. Jupiter, because the most massive. Venus, because enough close to the Sun. All the others have no significant action. (Too distant or not rather massive). These tides are hardly discernible. It explains as a result of the nature of the environment at the level of the photosphere. It is an extremely diluted gas subjected to complex turbulences. (Mechanical, magnetic). Let us look what could take place in the lower layers. In the radiative zone, at least on its surface, the seismology reveals nothing particular. On the surface of the core, we could hope to see by seismology, deformations connected to tides. but it is not the case, The core appears to us as a sphere. Inside the core, we see nothing. The waves are reflected about the surface and cannot penetrate beyond. What would there be in the core which would be sensitive to tides caused by Jupiter? The core is made by a gas of which the temperature is 15 000 000°C. The pressure, to which this core is subjected, is such as its density is 137. Therefore on the Earth, 1 cm3 of the sun core would weigh 137 grams. In the center of the Sun, the density would be ≥ 150. 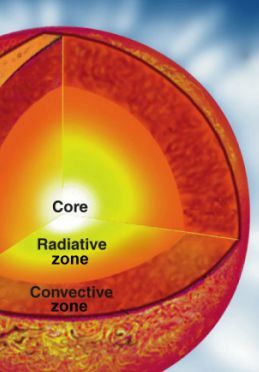 There would be in the center of this core an "inner core" which, under the influence of the pressure, would have most surprising physical properties. One cm3 of this seed would weigh more than 150 grams. Because of its rotation, this inner core would have a shape of an oblate spheroid. Composition: high density hyper fluid mixture of neutrons, protons and also charged particles? This inner core would thus behave, at least on its surface, as a liquid. In its centre it could be solid. Would it be Solid Helium ? It would be in a very fast rotation in a perpendicular plan with regard to a North-south axis. As a result of this rotation a magnetic field is induced parallel as the axis of rotation. The inner core takes a geometrical shape of a rotating elongated oblate spheroid. Symptoms of tides due to Jupiter, they are resonant rotating waves as an harmonic relation with the period of Jupiter (2 x 11.8 = 23.6 years). Thus tides are strongly amplified by these resonances. (Attention, you should not confuse the own rotation of the spheroids with the rotation of the resonant waves). Because of the differential rotations between the waves of tides of the solar inner core and Jupiter, these two waves would be resynchronized one after the other with a gap of 11,8 years. To generate two peaks of amplitude on the wave of tide. This is apparent in the solar cycles and in those of OJ 287 by both peaks observed at the top of every cycle. At every resynchronisation, for a reason which is not still totally clarified, the magnetic field of the solar inner core is inverted. The hyper fluidity of the solar inner core could be one of the causes. We evoke farther the second possible cause. A document (opposite), published by the NASA, shows us the distribution and the evolution, during time, of the visible magnetic fields on the surface of the Sun. You should not forget that there are also magnetic fields of surface which interfere with the solar deep field. It perturb a little the readability of this document. Let us add that it is necessary to realize that the roundness and the differential rotation of the sun deforms on the image the trajectories of magnetic fields. However hits interpretation, in view of the hypotheses which we present here, demonstrates that it would be in fact about a mechanical tipping up of the solar inner core. In this image, the positive magnetic fields are yellow and the negative magnetic fields are blue. We notice that the tiping up are characterized by unstable intermediate trails zones which are characteristic of the phenomenon. This shift is shown schematically in fig. 5. This is not a sinusoidal signal, but a trapezoidal signal. This is a set of switches, which generate large electromagnetic signals. With regard to the plan of the ecliptic, the orbit of Jupiter has an angle of 1.3 ° and the axis of rotation of the Sun is tilted by 7.25 ° from the perpendicular to the plane of the ecliptic. Thus it would be possible that this tiping up of the inner core is connected to these different angular values of rotations (7.25 ° +/-1.3 °) which lead, during resynchronisations, a twisting of the inner core explaining these tiping up and, on the picture, these blue and yellow trails colours. This image of the NASA is an almost sure proof of the existence of an inner core in the center of the Sun. We can notice that the Sun has for peculiarity to present a certain transparency to magnetic fields. From this image and those who maybe will follow, it will be possible to determine the dimensions of the inner core, and from the intensity of the magnetic field, we could deduct the electric current in the inner core. With our big regret, we don't know the positions of Jupiter with regard to the magnetic fields of this image. It remains to explain the physical phenomenon of transmission of the signal between the Sun and OJ 287. Is it a gravitational wave, an electromagnetic wave or possibly an other thing? We know nothing about it for the moment. However, if the distance between the Sun and OJ 287 is only 100 ly, things should be facilitated there. But let us look all together at what we can deduct from observations. Here the generator is the Sun, and it is right by the Earth. They are ideal conditions for their detection. But until this day we discovered nothing of such. Thus we have to eliminate this hypothesis. Because of its rotation, the magnetic field of the Sun takes the shape of a logarithmic spiral with a period of 11.8 years (Parker spiral). Every new period, the new element of this spiral changes of polarity with regard to the precedent. Thus it is a magnetic wave of big amplitude and its period is of 11.8 years. It propagates, in some degrees near, in the plan of the ecliptic. This wave could be thus very well the activating source of OJ 287 which, (we remind you) is in the constellation Cancer that is in the plan of the ecliptic. But at present we ignore by what means it makes it. 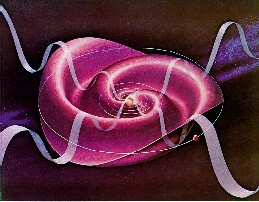 The Parker spiral transports the particles of the solar wind. It allows probably the cohesion of the lines of forces during the transmission of the magnetic wave towards OJ 287. The Parker spiral has the shape of a double logarithmic spiral, what implies that its speed of propagation increase with the distance. It complicates the calculation of the distance Sun → OJ 287, because if the signal received from OJ 287 propagates at the speed of light, it is not similar for the magnetic wave. The only thing which is known is the duration of the going there and back of the signal, that is approximately 200 years. Thus the distance of OJ 287 is lower than 100 al. We realized a map of the region of the zodiac where OJ 287 is. To see it in its entirety, it is enough to click the reduced image, opposite. The sun equatorial ascending node is in the Taurus constellation. Rather close to the Cancer. § The quasar OJ287 is 2°.59 in the North of the ecliptic and is 3°.33 in the South of the plan of solar equator. It had been too beautiful that this quasar is just in the plan of the solar equator! By taking into account the slope of the plan of rotation of the Sun (7,25°) and of the increasing thickness of the spiral of Parker according to the distance, we realize that OJ 287 cannot escape the influence of the magnetic field of the Sun. There is at present, at the astrophysicists, no accepted theory allowing to explain the atypical red shift of OJ 287. However a physicist Dr. Jacques Moret-Bailly proposes, for some years already, a theory which leans on the quantum theory. (CREIL effect). We cannot affirm that this theory is the one who will impose itself. So, we dedicated him a page "New Culinary Recipe to Make a Quasar" in which we can find a list of his publications. We are very glad that some scientists are finally focusing on these controversial topics. wave of Kotov: There is another coincidence between the Sun, Jupiter and the "quasar" OJ 287. It is about the 160 minutes period of Kotov already evoked in Quasars and Wave of Kotov. It seems that the wave of Kotov applies so very well to the orbital radius of the giant planets of the solar system and in particular to Jupiter, but in that particular case, with approximately a 10 % excess as shows us the table below. is the wave length corresponding to the period of Kotov). We realize in this way that the orbital periods of the giant planets in the solar system and in particular that of 11,8 years of Jupiter would be connected to the wave of Kotov ! We can envisage that it would be gravitational resonances on which would have locked these planets at the beginning of the solar system forming. They would not practically have evolved since, except Jupiter. We can explains very well the case of Jupiter if we make the analogy with the system Earth-Moon: the Moon goes away little by little from the Earth as a result of the side-effects tides and Jupiter goes away little by little from the sun as a result of the side-effects tides in the Sun. What a strange thing that to be able to date with a certain precision the forming of the solar system thanks to the wave of Kotov! It is a thing even stranger that to be able to measure the energy consumed by the tide effect of Jupiter on the Sun. This gap of Jupiter is a supplementary proof of this tide effect on the sun. The wave of Kotov was also discovered in OJ 287. It is not strictly speaking a coincidence. Because we discovered it in numerous objects in the universe, for example stars (Delta Scuti and RR Lyrae) or quasars. All these objects are distributed in all the heavens. Thus this implies a large-scale phenomenon for which we cannot define a source in particular. Is it a common property to all the concerned objects? Would it be a natural cosmological phenomenon as seem to think Dr. Valery Kotov, Dr. Christian Bizouard and Dr. Francis Sanchez ? Sun and Wave of Kotov. In our knowledge, the sun inner core is a new phenomenon. A solid-liquid inner core had never been thinking to consider by anyone. The propagation of magnetic waves acting at distance on other astronomical objects is a new phenomenon. It had never been envisaged previously. Is it possible that there are spirals of Parker associated to some other stars? The answer is probably yes! An extraordinary celestial spiral ESA-Hubble. Surprising Spiral Structure Spotted by ALMA (ESO). Can this phenomenon last for a long time? Certainly not. Simply by the fact of the specific movements of the solar system and of OJ 287. And perhaps also as a result of the precession of the axis of rotation of the Sun. But it would be of the order of 41 billions years, thus in a scale of time such as it is totally imperceptible. (IMCCE - Paris Observatory). The observations and the assertions of Halton Arp take a new shape. It is henceforth impossible to ignore them. The proof that a quasar having a cosmological red shift would really be situated at a galactic distance was provided. It will not be without consequences in astronomy and in cosmology. Would the massive exoplanets be, as Jupiter, in tide interactions with a stellar inner core? And what would be the consequences on the stellar theory of evolution of these systems? The observation of the magnetic fields of stars and their evolutions should be rich in discoveries. § On 10/14/2015 a Press release from CNRS, learned us the discovery of a "magnetic Delta Scuti star". § On 10/23/2015 an other Press release from CNRS, learned us the discovery of high "magnetic fields" hidden in the heart of stars, with "astérosiesmology". This discovery was made in a "Red Giant Star". We are now entitled to suppose that these stars would have, as the Sun and as the earth, an inner core. It opens the following prospect : all the stars would have an inner core. For 61 Cygni B, we have only four cycles. For SO 102, we have only a single cycle. New On 08/01/2017, scientists who use the ESA / NASHO SOHO solar observatory have found long-sought seismic gravity mechanisms that imply that the Sun's nucleus rotates four times faster than its surface. (Source ESA). This seems to confirm that it would indeed be a seed consisting of hyperdense, superconducting helium. If it was not, then its speed would be slowed down quickly by the friction against the hydrogen of the sun. All the works quoted below, do not consider, for a very good reason, the possibility of a physical link with OJ 287. This can explain, at least partially, the debate between the astronomers from the initial publication of A. Dauvillier. A. Dauvillier - Physique solaire : interprétation mécanique de l'activité solaire - Ciel et Terre, vol 93, pp.204-214 (juillet-août 1977). Réflexions sur les causes de l'activité solaire et de l'organisation en battements de ses pseudopériodicités. - Etienne A. Bernard - Institut Royal Météorologique. Dynamics of the interplanetary gas and magnetic fields - E N Parker - University of Chicago. Effet CREIL - Jacques Moret-Bailly. Thanks : For all who brought us their direct help, often decisive.